Vegas Spins is an online casino that forms part of the Cassava Enterprises/888 Holdings group. The site wants to bring all the glitz and glamour of Las Vegas to you. The logo is adorned with neon lights that really pop on the black strip that runs along the top of the screen. Scroll further down and you’ll be met with a deep purple background, exuding the idea of wealth and extravagance. As well as evoking feelings of luxury, the black and purple work well together to create an attractive looking site. The home page is well designed with promotions highlighted near the top. As you scroll down you’ll be presented with some of the games offered at the site. At the top of the screen you’ll find tabs linking to whichever section you want to go to. As the site’s title would suggest, Vegas Spins concentrates mainly on slots. There are over 200 games to choose from including top hits such as Fluffy Favourites and Starburst as well as progressive jackpot slots like the ever-popular Wonder Woman game. You’ll also find a decent collection of table games such as Baccarat, Roulette, Deuces Wild and Keno as well as live casino options for some games. Many of the slots and casino games can be played in demo mode, allowing you to play for fun or get a feel for each title before you commit to spending your own cash. 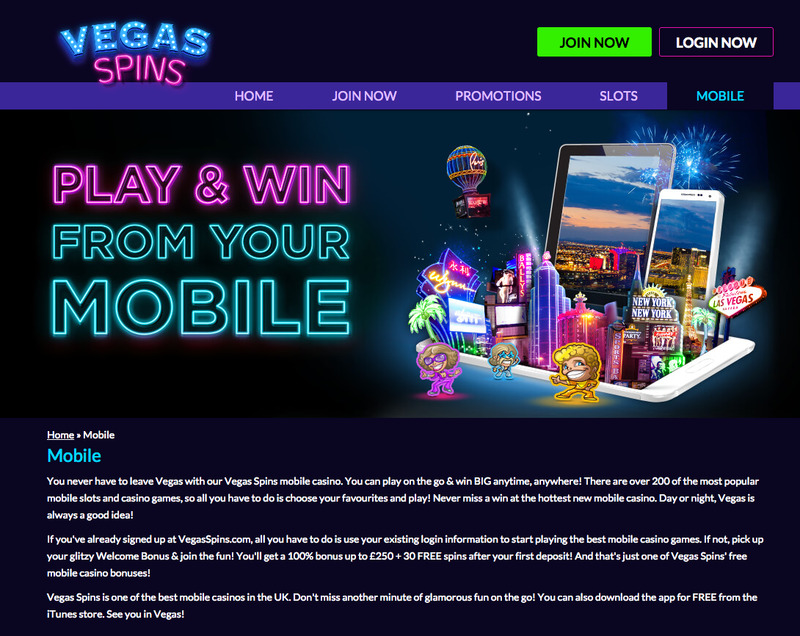 The simplicity of the Vegas Spins website is extremely well suited to mobile play. There’s little difference between the desktop and mobile sites, which means you can play anywhere without having to hunt for your favourite games. Just type the address into your browser and you can start spinning in no time. The site is compatible with both Android and iOS devices and if you prefer to use an app you can download it from the iTunes Store.